Sun To The North: The Inyo Range Salt Tram Expedition, September 2010 Part 2! The Inyo Range Salt Tram Expedition, September 2010 Part 2! We also had to have a fairly good schedule because we'd be meeting up from all over California and trying to see and do many things in just 3 days. Originally called the Eclipse mine and then the Brown Monster mine. The Reward mine supplied the largest trove of gold in Owens Valley. The mines were active from 1860 to 1936. The town of Reward served as a trading center for the mines in the valley and had a post office from 1900 to 1906. It is located roughly across from Manzanar: http://www.nps.gov/manz/ about 6 miles east of 395 on the west slope of the Inyo Mountains. Manzanar is 9 miles north of Lone Pine and 6 miles south of Independence in the Owens Valley, about 226 miles from "Los Angeles" and 200 from San Bernardino. We planned to spend the afternoon carefully examing the two mines and then have the first of two potluck dinners. In our preparations for this trip we exchanged quite a few emails about potluck dinners so it is always important to keep in mind how a great meal can cap off a day of outdoor activities. 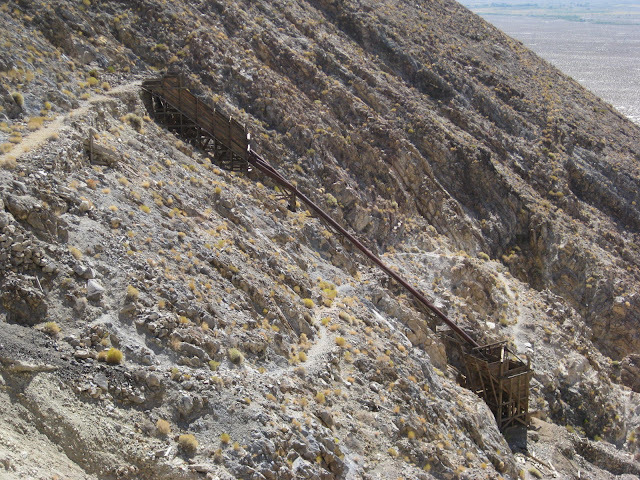 One of the mine structures, carefully perched in the steep terrain. Note the hiking trail that passes around it. Have breakfast and head back out to highway 395 and drive to Keeler where we'd head up through Cerro Gordo. 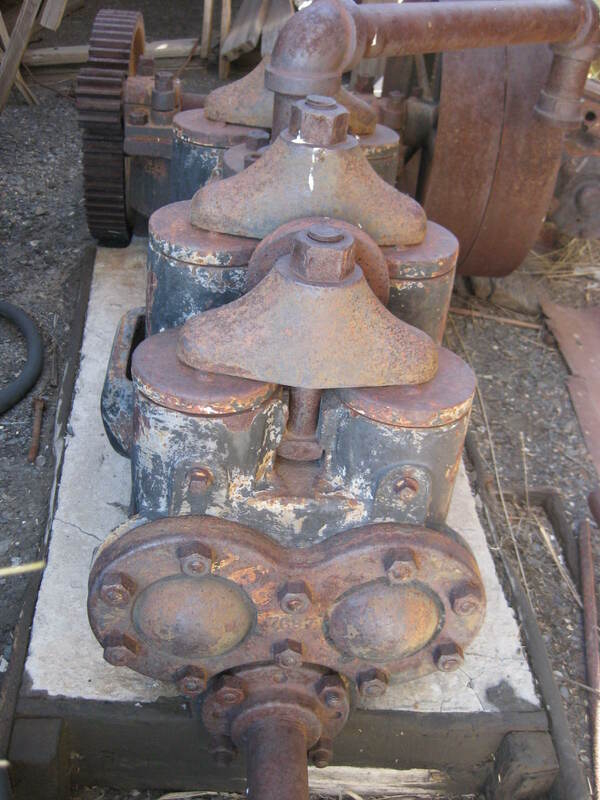 Then we'd go across the Inyos with stops at a mine shaft that goes through a 1/4 mile of solid rock and at Mexican springs where steam powered pumps labored to send water to Cerro Gordo. After that we'd set up camp near the historic Salt Tram Summit Station shown here in its glory days with a fully covered tramway station and in later days. We'd explore the surroundings, set up camp on the far side of the structure and have another potluck dinner. Jim, what is the NEW cabin used for. I recall seeing it and tramping around it, but I don't recall its use?? It is a rebuilt version of the Salt Tram "tramkeepers" cabin. I can post up a picture that I found of one of the old family photos in front of the cabin. The newer wood on the roof is not too weathered so it looks pretty new.